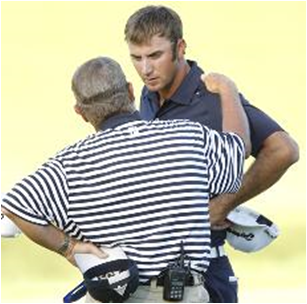 A Rules Official gives Dustin Johnson the bad news. Coincidentally, I had already drafted this blog entry before the dramatic conclusion to the PGA Championship at Whistling Straits, Kohler, Wisconsin on Sunday, when Dustin Johnson was penalised two strokes for grounding his club in a bunker on his 72nd hole, resulting in him not making the playoff with Bubba Watson and Martin Kaymer, the eventual winner. The organisers even taped an 8" x 11" sheet of paper containing this clarification to the mirrors in the locker rooms. So, you will gather that I have little sympathy for Dustin Johnson, an elite professional golfer who makes a very substantial living from the game, for not knowing, or perhaps forgetting, that he could not ground his club in any of the 1,000 plus bunkers on the Whistling Straights course. It is Rule 33-8a that permits Committees to make and publish Local Rules for local abnormal conditions, providing they are consistent with the policy established in Appendix l to the Rules book. Let us consider why it is so important to familiarise yourself with Local Rules by posing a few questions. May you take relief without penalty when your ball comes to rest on a teeing area? May you remove stones from bunkers? May you use an artificial device that solely measures distances? May you take relief from young, staked trees? May you take relief from woodchip pathways? May you choose to play from ground under repair rather than take relief? May you take relief without penalty for a ball embedded in its own pitch-mark in the fairway? May you take line of putt relief from a sprinkler head located at the edge of a putting green? May you take relief without penalty if your ball comes to rest in an aeration hole made by a greenkeeper? May you take relief without penalty when your ball comes to rest on a teeing area? No. May you remove stones from bunkers? No. May you use an artificial device that solely measures distances? No. May you use binoculars? Yes. May you take relief from young, staked trees? No. May you take relief from woodchip pathways? Yes. May you choose to play from ground under repair rather than take relief? Yes. May you take relief without penalty for a ball embedded in its own pitch-mark in the fairway? Yes. May you take line of putt relief from a sprinkler head located at the edge of a putting green? No. May you take relief without penalty if your ball comes to rest in an aeration hole made by a greenkeeper? No. How many did you get right out of 10? Now, if the Committee had introduced Local Rules; to prohibit playing from all teeing areas; permitting the removal of stones from bunkers, relief from sprinkler heads located close to putting greens and the use of devices to measure distances only; making it mandatory to take relief from staked trees and GUR; then six of these answers would have been different. I hope that this persuades you that it is imperative to scrutinise the Local Rules before you start a competitive round of golf. A related point that many players overlook is that if you do not fully comply with a Local Rule then you still incur the penalty. For example, if your ball comes to rest close to a staked tree and there is a Local Rule stating that you must take relief from staked trees, you must ensure that neither your club nor any part of your body touches any part of that tree during your stroke, or you will incur a penalty of two strokes in stroke play or loss of hole in match play. This is true even if you have taken relief, but not sufficiently to have avoided the tree during your stroke. That is, you must take full relief from the staked tree that interferes with your stroke. Knowing the Local Rules and Conditions of Competition that are in effect is essential before commencing any round of golf. Ask Dustin Johnson! There are 20 questions relating to Local Rules in my book, ‘999 Questions on the Rules of Golf’. Order a personally signed copy and have it posted to anywhere in the world for just $19.99 (£12.99, €14.99). This book can help every golfer enjoy their sport more, improve their scores and make the right decisions on the course. Click here for more information. I certainly understand the rule as it was written but in my opinion the walking rules official, David Price, should have reminded Dustin that the ball was in fact in a bunker. The term "all areas of the course designed and built to be bunkers" certainly left one to wonder what the status of that area was since it certainly didn't look like a bunker. The reason to provide walking riles officials is to assist the players and help them from incurring needless penalties. Before Dustin approached his ball David Price walked down the opening in the crowd toward the fairway. The last thing he should have said was the reminder that the ball was in a bunker. Obviously someone saw the infraction on TV and radioed to Mr. Price because he was not in a position to see the violation. I cannot agree. There are over 1,000 bunkers on Whistling Straits and there were 156 competitors taking part. The Rules Officials are certainly not there to keep reminding players of the Local Rules, which had already been highlighted to them. Apparently, no-one else made the same mistake during this PGA Championship. That he and at least one other player claimed that they did not even read the sheet with the local rules makes the player at fault. They missed the number 1 item on the sheet. I feel bad for Dustin and I know that he will be a great player but .. come on - read the sheet! I have officiated at over 50 national championships, including 16 U.S. Open Championships and I can assure you that a walking rules official should try to prevent and penalties that he can. The circumstances at the time with Dustin being the leader and the fact that the bunker was outside of the ropes and didn't really look like an area prepared as a bunker would have made me remind the player that it was , in fact, a bunker! Sure it is the players responsibility to know the rules but it is the officials responsibility to prevent any problems they can.